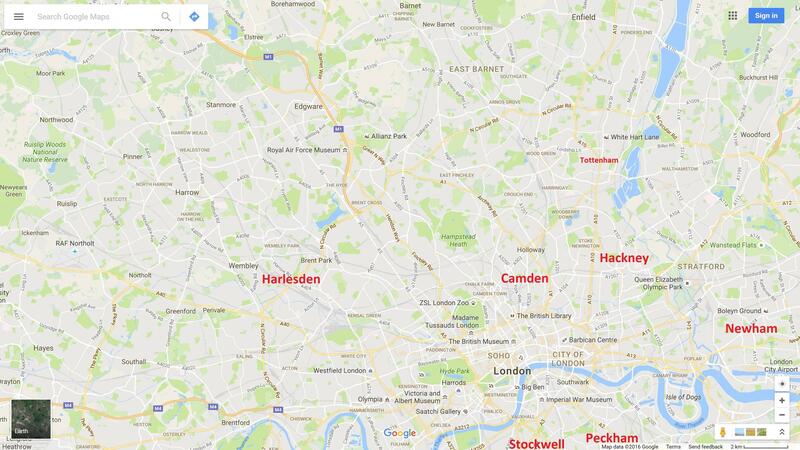 What are the most dangerous areas of London north of the River Thames? Within only the following map, which are the most dangerous areas (like those depicted in the 2009 movie Harry Brown, filmed in Walworth, London at the now demolished Heygate Estate, and Marks Gate, Romford, Essex)? I most fear harm or injury to a lone pedestrian (especially someone defense like the youth or elderly) caused by random (e.g. crossfire between gangs) or deliberate acts of violence (mugging, theft). I added in red this website's opinion of the 10 most dangerous areas. There aren't any areas of London where you shouldn't go alone even in daytime. That just isn't a thing in the UK - there are no areas outside of police control. Cafés, restaurants, pubs and clubs. 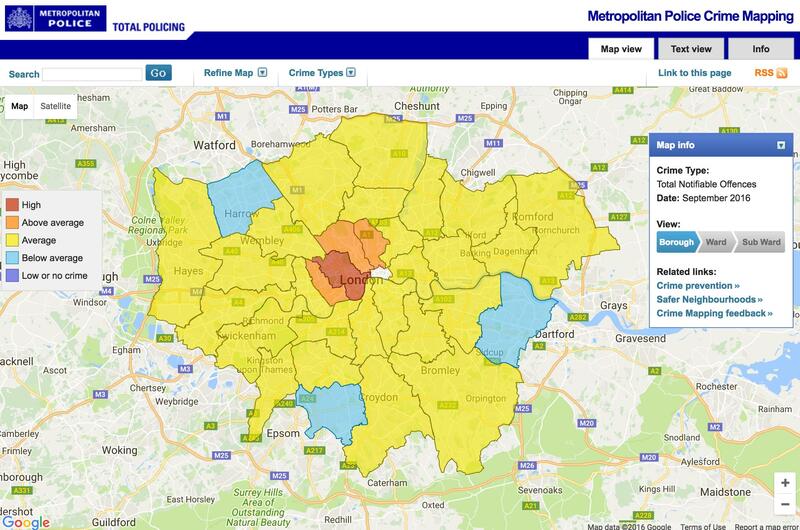 areas are colour coded according to how their crime rates compare to the average for London. This is done using standard deviations - a statistical measure used here to calculate how close to the London average an area's crime rate is. You can change the settings on that map to show the kind of crime you're most concerned about - e.g. if you're a tourist it's likely to be personal robbery and 'violence against the person' (i.e. violence). You'll find that Westminster generally has the highest crime rate because it's the main tourist and nightlife district and so has the highest ratio of visitors to residents (the City of London, which is the financial district and also contains a number of major tourist attractions, is not included in these numbers). Prepare and consider your travel arrangements carefully and ensure someone knows where you are going, who you are with and when you might be home. Look as assertive as you can, walk with confidence and be aware of your surroundings and who is around you. Avoid short cuts and dark isolated areas, vary your routine and be discreet handling cash, phones and wearing jewellery in a public place. Never take your safety for granted and look after your friends so that they don’t become vulnerable. Remember your personal safety is more important than your phone or other valuables. Keep your bags close to you and secured with zips closed. Check your belongings and your pockets regularly. Wearing headphones and talking on the phone can make you unaware of your immediate surroundings this makes you appear vulnerable and gives an advantage to a criminal. If you use a cash point or ATM be suspicious if you see someone hanging around, if in doubt use another cash machine and have a friend watch your back. If you feel uneasy about an individual or situation, trust your instincts and leave the area and head towards a public place such as a shop. Pre book a licensed cab to pick you up or use a mini cab office. Never get into a mini cab off the street they are illegal and often uninsured and dangerous. Met Police: Advice > Crime prevention > Personal safety > What do I need to do? Compared to other world cities on homicide rates, London is quite safe with 1.6 homicides per 100,000 people - this compares to 5.6 for New York or 4.4 for Amsterdam. (Source: Where are world's deadliest major cities?, The Guardian Data Blog 2012). poor, in a gang, in a violent relationship or already involved in crime. The likelihood of being randomly stabbed or shot is much, much lower than these statistics indicate. In London you're extremely unlikely to have any contact at all with firearms unless you specifically seek them out. I've lived in London all my life and have never seen a real handgun here (or anywhere in the UK). The homicide-by-firearm rate for England & Wales is 0.07 per 100,000 people - this is fairly normal for a European country (France is 0.06, Germany is 0.19) but of course way below the States (2.97). Source: World firearms murders and ownership from Gun homicides and gun ownership listed by country, The Guardian 2012. Not the answer you're looking for? Browse other questions tagged london security solo-travel or ask your own question. Is it safe to keep luggage in a car in London and nearby areas? What does “The following London stations are available for travel with the chosen ticket” mean? What are the taxi options in London? What is the most dangerous area of Los Angeles (or its suburbs) according to police statistics? Where are the main clothes shopping areas in London? London Heathrow: What are the options while waiting for hotel check-in? What are these London appetizers? What places are considered outside Greater London?